Medieval Bluetooth File Transfer make you to use your cell phone to browse, explore and manage files of any Bluetooth ready device (File Transfer Profile - OBEX FTP)! Download, upload, explore, search, edit, create, delete and rename files and folders on your phone, PDA, palm, notebook, PC, photo viewer, music player and so on; using an easy, fast and intuitive user-interface (GUI). Transfer or delete many files and entire folders at once . 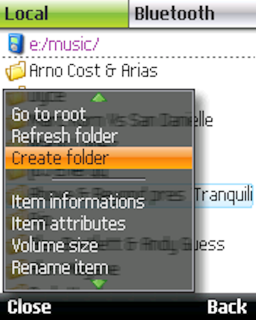 ...... Search files across filesystems, using rapid and customisable parameters. Explore hidden files, or make your personal data private and/or read-only, using the attributes editor (local filesystem only). Cut, copy and paste files and folder across filesystems. Save your favorite devices in the bookmark list, to speed-up the connection procedure. Require: MIDP 2.0 and CLDC 1.1. Qweas is providing links to Medieval Bluetooth File Transfer 1.50 as a courtesy, and makes no representations regarding Medieval Bluetooth File Transfer or any other applications or any information related thereto. Any questions, complaints or claims regarding this application Medieval Bluetooth File Transfer 1.50 must be directed to the appropriate software vendor. You may click the publisher link of Medieval Bluetooth File Transfer on the top of this page to get more details about the vendor.